Some times I don't know where to start ... so much goes through my head in preparing for the art show. I'm excited, happy and sometimes overwhelmed. It is amazing to see so many people who have successful business. I often think "how". Were they lucky or have a "I don't care" attitude??? Or how to they get "photography" jobs. I think I would be more comfortable starting at that point. 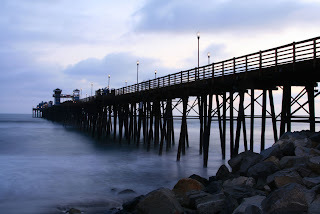 The photo (right) is the Oceanside Pier, taken just after sunset. I'm getting items ready for my show on Aug. 30. I went through all my existing greeting card and discovered that I needed to add more beach and oceanside photos. I updated them and had them printed. I'll work on the cards tomorrow. While I was reviewing in photos, I found the inventory of blank bookmarks. So ... I decided to add that to my show too.